Those who have not submitted themselves under the authority of the Gospel is not guided by the Truth but are tossed around by their own decietful desires. Such are faced with unlimited options as far the direction of their life's journey is concerned. They are guided by too many dim and dull lights. Everywhere there are mega offers and jackpots to entice the pleasure seeker. Their journey is wayward and aimless. They sway in all directions like drunkards. Their road thus is wide and entrance is wider. They will not reach any destination for they have none. The road they traverse is illusory and deceptive. They are trapped and are headed to eternal nothingness. No passengers in this extra wide highway care about each other. They are utterly selfish and always competing to get ahead of the other by hook or crook. Fear, anxiety, greed, jealousy and hopelessness linger in the air above them. Their souls are never at peace. Bible says many will choose this road - to doom. On the other hand, to the one who seeks truth, the truth is revealed in the person of Jesus Christ. The one who finds the truth and decides to walk in the way of the Gospel is guided by a single point of reference that is Jesus Christ himself. He is guided by the one and only light - the son of God. 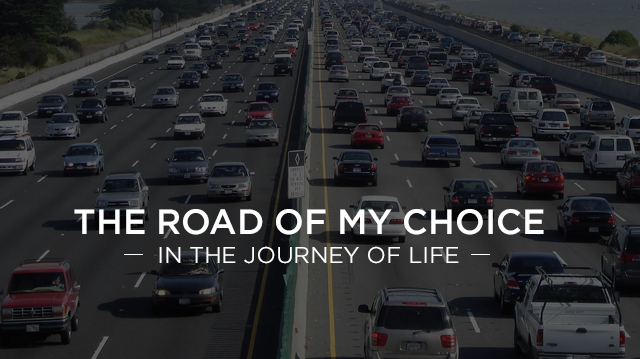 The road he chooses is a simple, single lane with no deviations or detours. The pilgrims who choose to walk this path, walk on a straight path and they do not sway or wander. They do not need a wide road nor wider entrance. Jesus is all sufficient for them. No one is in a hurry. No one is overtaken or overthrown. All are assured of the destiny. All are content and happy because Jesus is all sufficient. All seek to help each other and journeys faithfully till the destination embraces them. Their souls are at peace cause they have found rest. We often think that it is God who made the path narrow and entrance small, making it difficult for anyone to walk in it. But fact is, it is the personal choice one makes that decides the kind of road he would walk - six lane highways or the peaceful single lane where Jesus himself is the guiding light. Those who traverse on this road finds life. Choose Life.